Sterling Christian School faced a unique challenge: they needed to convert a warehouse space into a functional gym space that could also perform a number of other functions. It had to be a good place for kids from Pre-K through high school. It had to be useable for school performances. It had to be a good environment for a children’s ministry. And it had to tolerate the high use that comes with a school. The list of needs required a floor that could hold up under the pressure. 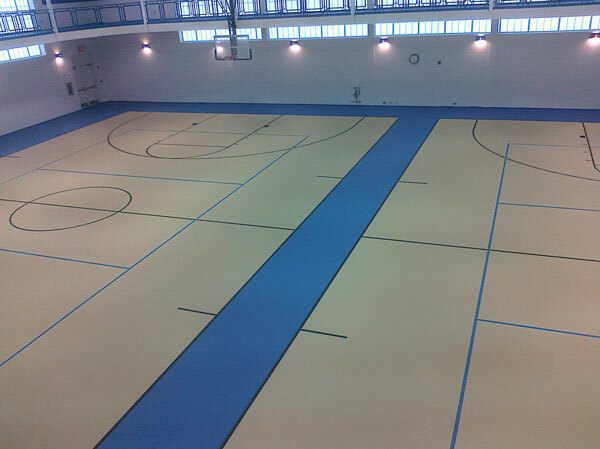 Adrian College needed a new floor for their high-use campus athletic facility in Michigan. As a residential four-year college with many varsity sports teams and clubs, their athletic facility served hundreds every day. Their old Keifer floor just wasn’t holding up under the traffic, and they needed a cost-effective replacement option. The gym building had diverse flooring requirements, ranging from courts for basketball, volleyball, and tennis, to a track section and batting cages. Each of these areas required minor differences in their flooring for optimal performance. When Dr. Scott Rawlinson of the Color Country Animal Hospital in Cedar City, Utah, decided to build a new facility for treating large animals, he saw an immediate problem. “I couldn’t find any flooring that impressed me,” says Dr. Rawlinson. “The products I had seen concerned me because they have seams in their floors. Animals make messes, and when you hose down the floor it seeps into the cracks and you have problems with the flooring.” Ultimately, Dr. Rawlinson decided on a finished concrete floor for his new facility. Although it wasn’t optimal, he felt it was the only choice that would offer the necessary strength to hold up under use by large animals while containing the messes they can make. In early 2006, Midland University built its new multi-purpose event center. Replacing an old and outdated facility, this new building had to be incredibly flexible and useful for many different types of events. The general contractor knew that it would need to hold up through PE classes, team practices, banquets, concerts, and more. Plus, it needed to handle wear and tear from spikes and hard activities such as the shot put. Recognizing these very diverse needs, the general contractor recommended that Midland choose an indoor flooring system. Today’s high-performance sports construction is all about materials. Companies are always pushing the envelope with new designs that offer better impact protection for athletes, as well as superior durability for long-lasting flooring solutions. Dynamic Sports Construction has long been a pioneer in this field, creating new flooring solutions for everything from basketball courts and indoor tracks to equine facilities. In recent years, we’ve turned to a rejuvenated and new generation of an old standby: polyurethane, specifically our DynaFlex® system.